I believe in destiny. I feel a special bond with someone who I happen to meet despite all the odds. 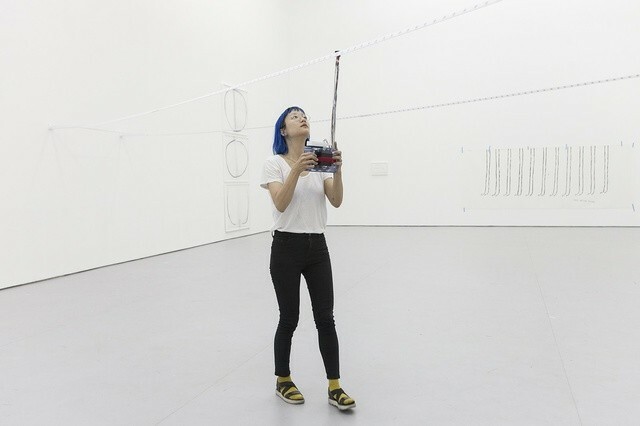 I felt that way strongly about sound artist Christine Sun Kim. Perhaps I could’ve been able to connect to her rather easily because of our similar cultural background. I was a lonesome international student from Korea in college surrounded by colleagues who don’t get my struggles every inch. Full of self-doubt, I was then desperate to find a mentor figure or inspiration who made it in art as an immigrant. Along the way, I had a delightful encounter with Christine Sun Kim first time. One of the galleries at school had her over for a short term artist-in-residence program. I missed the artist talk because of schedule conflict and in retrospect I don’t think I cared for it as much. So yes, it was my huge loss not going to her talk. Returning to Korea, I thought I’d never see her work again, but surprisingly she was one of the participant artists at the media biennial in Korea. With all my heart, it felt like a destiny. Not everyone gets a second chance, do they? I finally participated her performance on site (even better), which cleared out my curiosity for unknown subject to some extent. Again it’s a genuine embodiment of Felix Gonzalez Torress’s words: your limitations should be your strengths. Kudos for Christine Sun Kim.